At the end of the summer we are doing a whole pig roast. To practice we have been cooking different cuts of the pig to see how they cook while being smoked. The traditional way to make Jamaican jerk pork is to take the bone off the shoulder. Jamaican jerk seasoning is really hot so use as many peppers as you think you can handle. We thought that by removing the bone the cooking time would be shorter but to be safe I would say cook for at least 8 or 9 hours. Remove the skin, Save this for another recipe! Cut the pork off the bone. Butterfly the shoulder removing any access fat and tendons. 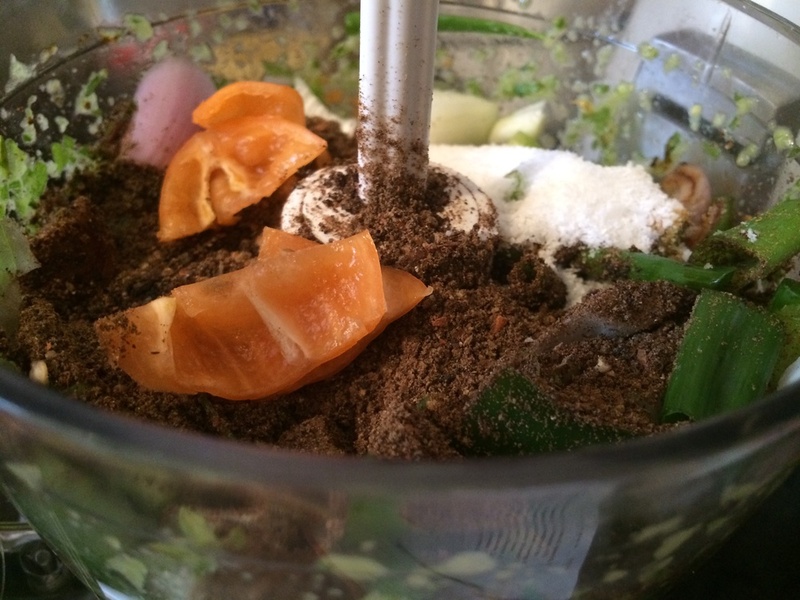 Make marinade by blending up all the ingredients and letting it sit for 4 hours in the fridge in a covered container. Once the shoulder has marinated, heat smoker to 250 degrees. Put shoulder on the grate and close the top. Put the pimento woodchips on the coals to get the smokey flavor. If you can't find pimento order hickory. We ordered ours online from Jamaica! Let the shoulder smoke for at least 8 hours or until the internal temperature is 190. If the meat is tender it will probably shred apart but since ours probably needed to be cooked a little more we sliced it. Enjoy your pork with sides like corn bread, tomatoes, corn and beer!